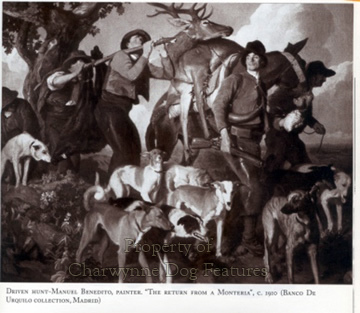 The great Polish artist Juliusz Kossak produced some quite superb depictions of Ukrainian Cossacks hunting with their local sighthound, the Chart Polski, a practice discontinued in Western Europe in favour of par force hunting with packs of hounds, rather than a brace or leash of sighthounds. 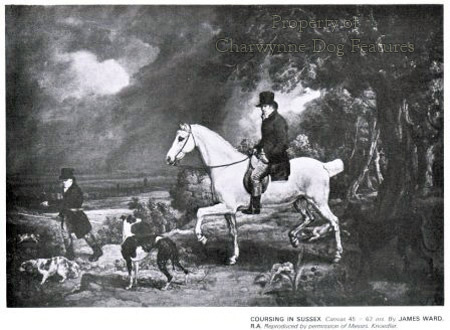 Coursing here was often conducted using mounted hunters, especially as adjudicators, but not since pre-Georgian times, as a principal way of hunting with dogs. A decade or so ago, some enterprising Ibizan Hound devotees in Britain, hunted from the saddle using their hounds both to catch and retrieve. 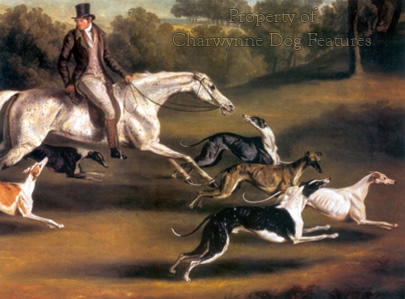 But formal coursing, with a brace of specifically-bred Greyhounds, became our established method of using sighthounds in the sporting field. Western Europe generally is not the most natural hunting field for hounds relying on sheer speed. In the more heavily wooded terrain there the preference for scenthounds is logical. It is much more understandable for countries with wide open spaces, like the prairies, the steppes, the plains of the Puszta, as well as the desert, to use horse and hound together. The Magyar Agar of Hungary may have been introduced by the invading Magyars, from the steppes of Russia, in the ninth century. Coursing hounds were also brought into both Hungary and Poland at the time of the Kievan Russian empire, which by 1030AD had formed the largest federation in Europe. The Mongols reached both Hungary and Poland in 1206-59AD invasions, no doubt bringing their hunting dogs with them. Ottoman armies passing through Hungary towards Vienna on the various invasions of that area in the period 1328-1683AD, would have been accompanied by their hunting dogs. 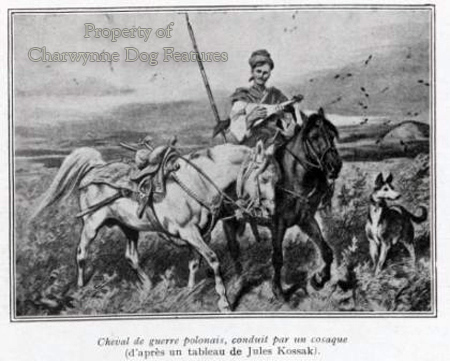 Trading in valuable hunting dogs, and parading them, especially by nomads or migrants is timeless. 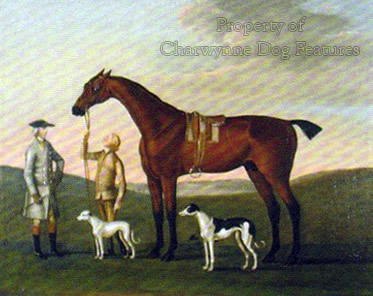 An Englishman, William Blaine, attended a hunting expedition of the Grand Vizier of the Mongol Empire in India in 1785, and listed 300 ‘Greyhounds’ and well over 200 hawks as part of the entourage. 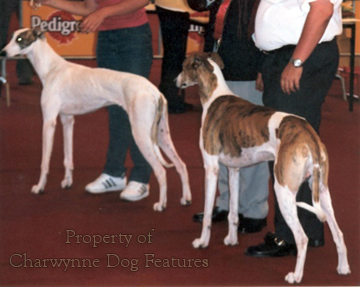 The Magyar Agar, or Magyarorszag, is around 55lbs and 26” high, coming in all the sighthound colours, with a short coarse coat. They are used on hare and foxes, sometimes kept as pot-fillers by shepherds. Racing Greyhounds have also been imported for track racing there in recent years and crossed with local coursing hounds. Stronger-headed than our greyhound, resembling our Greyhound lurchers, interest in the breed in its native land led to recognition as a breed internationally in 1966. I have seen them at World Dog Shows, such as Vienna and Budapest, becoming more uniform but sadly judged purely on appearance. The Polish sighthound or Chart Polski almost died out in the last century but a group of breed enthusiasts revived it and it now appears to be thriving. The ones I have seen sported the coarser tail, hinting at a link with the Saluki, but more likely from past Borzoi influence. 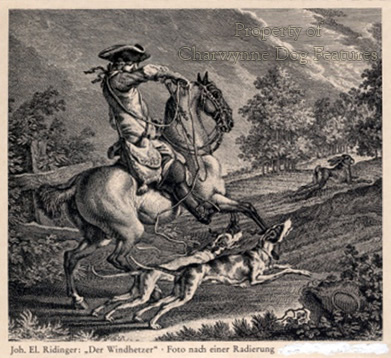 "The domestic dog", wrote Cuvier, "is the most complete, the most singular, and the most useful conquest that man has gained in the animal world...The swiftness, the strength, the sharp scent of the dog, have rendered him a powerful ally to man against the lower tribes; and were, perhaps, necessary for the establishment of the dominion of mankind over the whole animal creation. The dog is the only animal which has followed man over the whole earth". 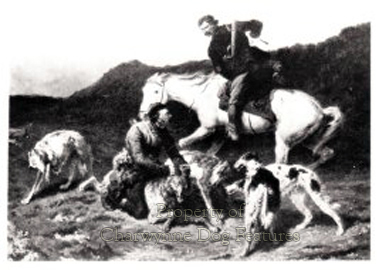 These comments completely overlook the value of horse to man and ignore the remarkable contribution of horse and dog together, not just to man's hunting and sporting activities, but to exploration and farming across many centuri es. Dog and horse have literally accompanied man "over the whole earth", with dog having the size advantage when it comes to sharing the hearth. Cuvier would have been on surer ground if he had stressed the sheer versatility of dog in its usefulness to man. This versatility allied to the facility given to man by the horse and man's own unique adaptability makes an extraordinarily valuable combination. Mounted herdsmen using hard-eyed herding dogs have benefited from this combined value for centuries, from the pusztas of Hungary to the outback of Australia. Genghis Khan used the hunting field to train his cavalry, accompanied by huge hounds. 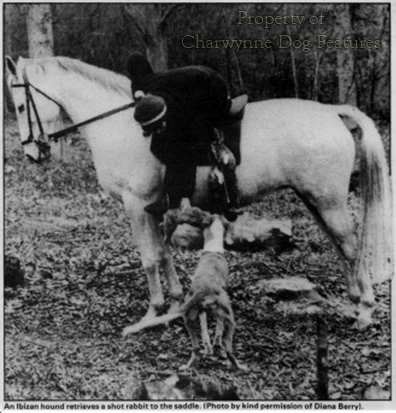 In South America, mounted huntsmen still pursue wild pig using big hounds like the Dogo Argentino. In Russia, horsemen used the handsome Borzoi to run down wolves, accompanied by scenthounds, in unusual combination, for their ultimate sport. Whilst in the Arab world, horsemen with hawk and Salukis, continue the age-old skill of gazelle hunting. In each case, in each part of the world, man utilizes horse and hound or herding dog to achieve his end, with all three working in harmony to one purpose. It is a unique combination in the animal kingdom and in man's use of subject creatures. Long may it continue, whatever the pressures of man's demand on land and the threat from his recently-developed moral vanity. Perhaps the complete lack of vanity in both horse and hpund makes them especially attractive to man, certainly as companions. Such a mutually-beneficial stable relationship is one to be treasured and well worth preserving in times when 'townmindedness' threatens to blind our traditional affections. May 21st century man have the wisdom to appreciate and then respect such a precious partnership.